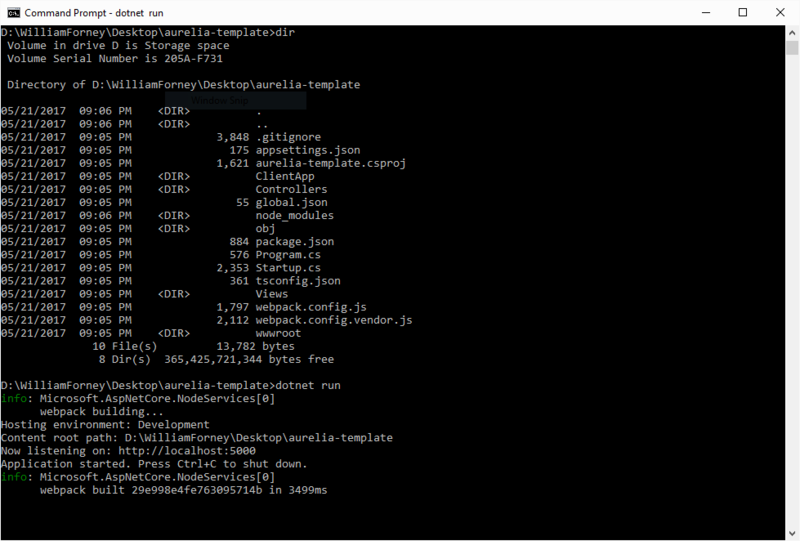 Open a command prompt (cmd) in that folder. Restart your command prompt to ensure that the environment change takes effect. This command compiles the server side C# code and runs a webpack production build on the TypeScript and client assets. You can then find the files to upload to your host in the bin\Release\netcoreapp1.1\publish folder. 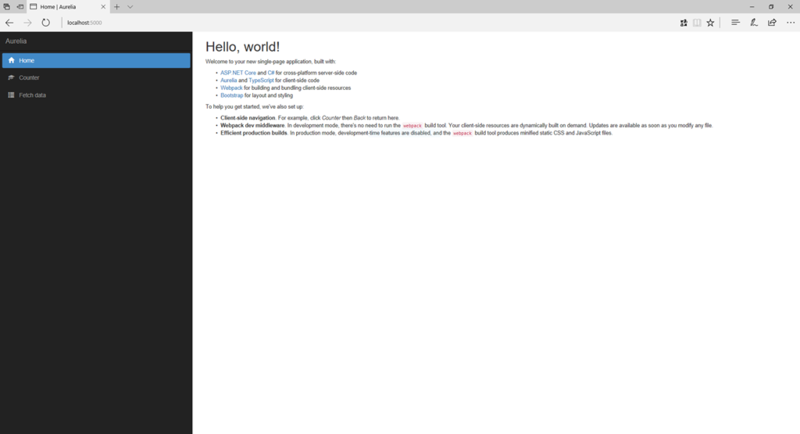 This template takes care of a lot of things that you would have to setup manually and makes a good starting point for adding more functionality, such as logging with Application Insights or another logging provider, fleshing out an administration interface for user management and authentication/authorization using Identity Server, or any number of other useful additions that are widely available. To get started understanding what we’ve got here, you’ll want to take a look into the files in your new project. You’ll notice that in Startup.cs we have setup a fallback route that allows anything not dealt with by a static file or MVC route to be sent to the Home Index view. This is the secret sauce that lets all your links work even though they aren’t configured individually. A while ago I was using TypeScript with these to help with intellisense and typing issues across the libraries and sites I worked on. I often find myself introducing whatever team I’m on to these technologies in one way or another. I’ve been working with the combination of ASP.NET Core, formerly ASP.NET 5, and Aurelia with TypeScript and Web Components. I start with the yoeman generator for ASP.NET and add the pieces as I go. I use ASP.NET MVC for the API and plain old HTML and TypeScript for the UI. The client tool chain consists of the usual npm, jspm, and gulp. 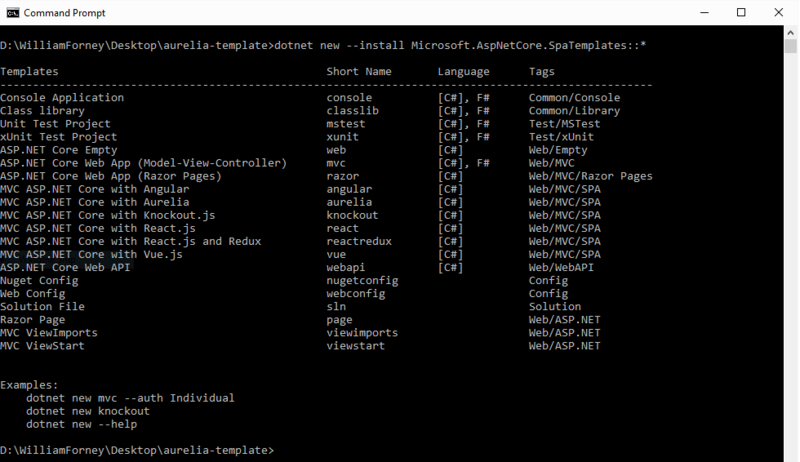 When the new ASP.NET bits are done I’ll make a template for all this and post it to github. In the meantime I’m considering doing a short video or slide deck walking through the setup if anyone is interested.